Over the past several months Aurora has been releasing a series of their 88 model pens known as the Minerali. In essence, Aurora is taking color and design cues from a variety of minerals that exist in nature and pairing those colors with a demonstrator barrel. The model I'll be reviewing today is called Azurite, which is inspired by a blue mineral/stone which develops from copper. It has been used for thousands of years for jewelry and pigment in painting. 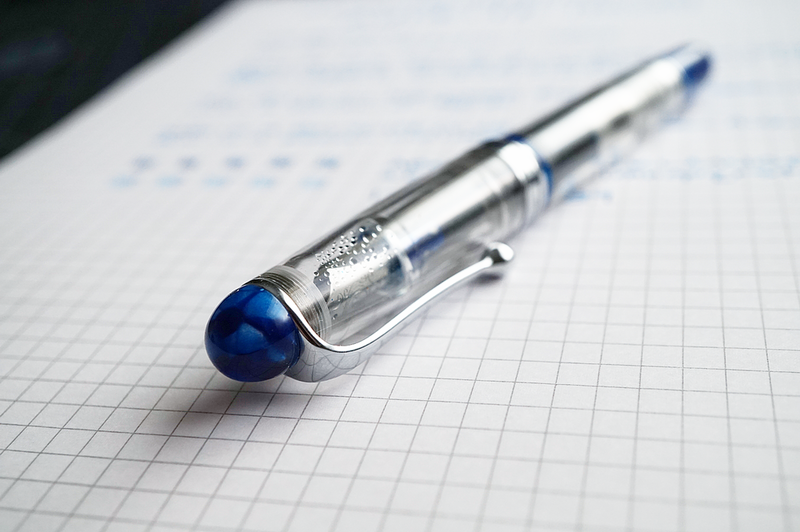 This particular pen is on loan from Goldspot Pens, so many thanks to them for providing it. The Minerali series are a limited edition product, each color being produced 388 units in total worldwide. Aurora seems to be doing a lot of limited edition runs of the 88 series which some could see as a bit fragmented (myself included a bit), but in thinking more about it I actually like that they are doing it this way. Many brands seem to stay a bit stagnant with their lineup, or only offer a slim variety in new additions or materials. 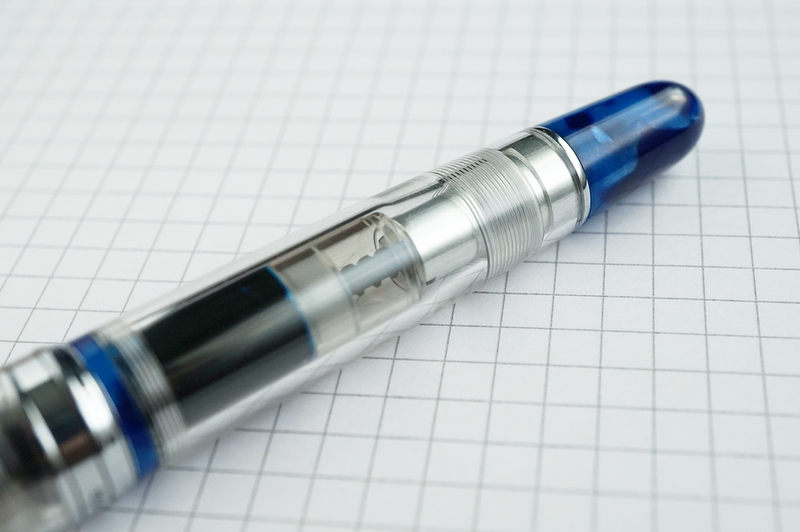 The 88 series is a full-size fountain pen, but not overly large at all. 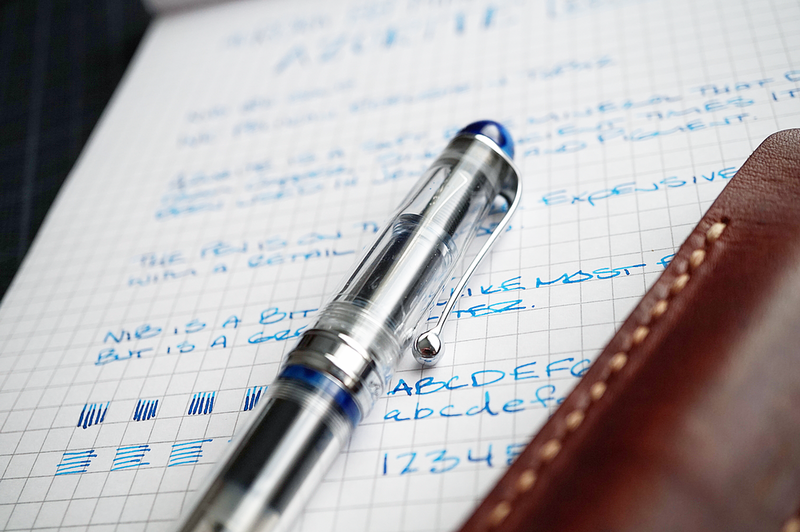 It is in-line in size with pens like the Sailor 1911 large, Platinum #3776, and even the LAMY 2000. It is actually an extremely comfortable size. 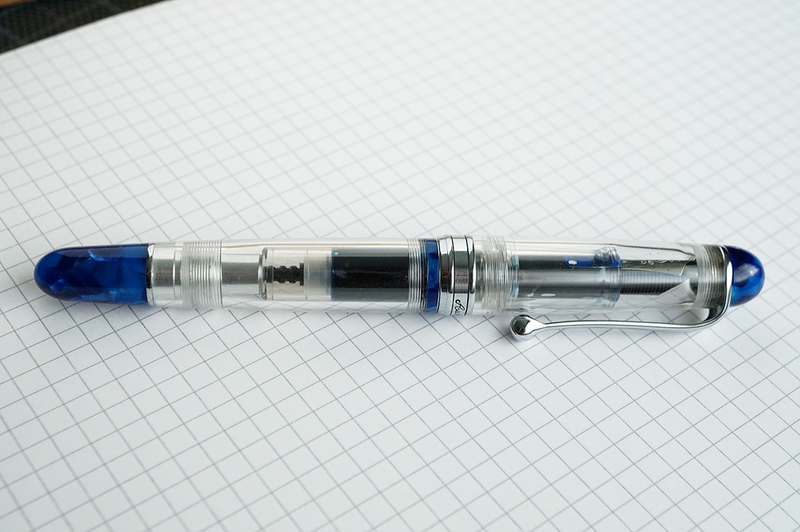 Overall, the pen is a demonstrator style with an all clear barrel, cap, and section, except for the finial and piston knob as well as a small slice in the very center which are a shimmery blue "azurite" acrylic/resin. These parts are a bit more of a patchwork of a few different shades of blue some being dark and opaque looking, while others are lighter with more of a metallic shimmer when it catches the light. I actually found filling the pen to be a pretty delightful experience as the piston and knob felt sturdy and solid. With some piston mechanisms there is a bit of "play" which always makes me feel like it is going to come apart. I have a Montblanc that does this even, but the 88 felt smooth and secure. My ink choice was one of my favorites, Pelikan Edelstein Topaz which I intentionally did to try and pair. The Topaz is a bit more on the lighter side, so not a perfect pairing... but, a great ink nonetheless. Lots of lovely shading and even a few hints of sheen here and there on the darker spots. Highly recommended and I probably ought to do a review all its own soon. 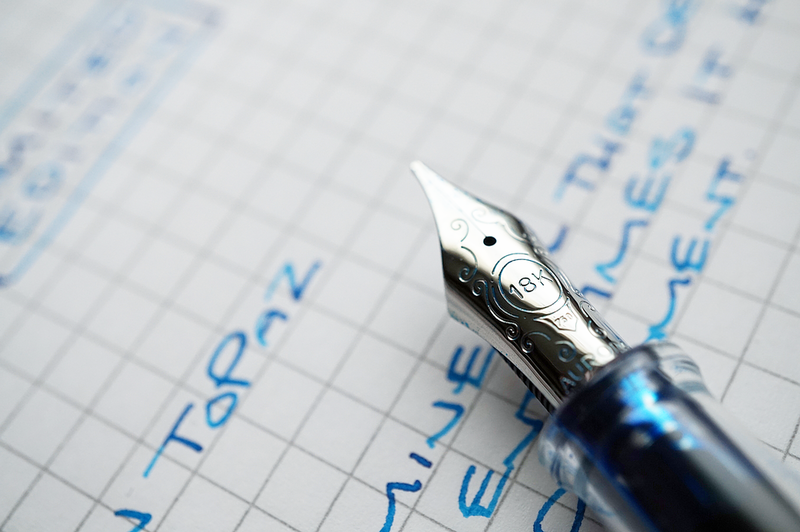 Like most in the Aurora 88 lineup, the Minerali also comes with an 18k nib. I requested a medium for the review and it is a comfortable and generous line. I haven't had any flow issues, hard starts, or scratchiness. There is a slight feedback on the page, but just the right amount for my personal taste. Too glassy and I almost can't tell whether I'm writing! Like other Aurora's I've tried, this one seems a bit on the stiff side, although does have some slight give. 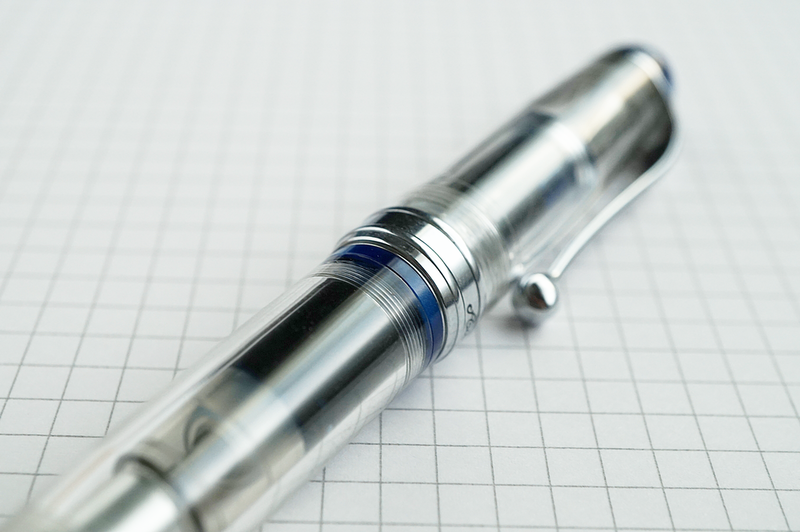 Unlike many pens I try or review, this one I actually prefer posted while writing. The cap overtakes the barrel by about an inch and a half while posted which puts total writing length at 6.25", an extremely comfortable size considering it's lighter weight. I find I prefer the looks of the 88 over the Optima. The cursive Aurora name around a thinner metal band in the middle of the 88 is a bit more tastefully done in my opinion. As far as fountain pens go, Aurora is a bit on the higher end of the spectrum, particularly their limited editions. This particular pen retails at $795, but street price right now is just over $700. This puts it in range of pens like the Pelikan M800, Sailor 1911 King of Pen, or even a Nakaya. When you start to float into this price range, the word "value" becomes I highly subjective term from person to person so I won't be making a recommendation or attempt to sway. What I do know, is that this pen is solidly built, probably one of the more sturdy feeling acrylic pens I've used in a while, the nib is a fantastic writer (even though it is on the stiffer side), and the overall quality of the pen is all there. No corners cut and nothing stands out as being out of place or looked over. So, is $800 a fair price for this pen? If the design calls your name and it's within the budget, I doubt someone would be disappointed with it. Special thanks again to Goldspot for loaning the 88 for review!